Zambeza only used reliable genetics of Afghan and Skunk for their fast flowering version of White Cheese. The name is pretty accurate to describe the sea of white crystals and trichomes, one finds on every Cheese bud. A reduced flowering period of approximately 50 days can help growers to achieve fast results. This can be beneficial for short outdoor seasons with a rainy fall. Reduced price! € 14.00 tax incl. Cheese strains are extremely popular for a good reason. The potency is definitely intense, yet different from what we experience after smoking some highly potent Haze. Originally, it was a crew of growers from London who managed to establish these exceptional cheese flavours in their buds. Once these genetics found their way into the secret location where breeders of Zambeza Seeds do their research and develop new strains, the game was on! Creating a highly stable and aromatic Cheese strain, with a flowering time of approximately 50 days, was the task that needed to be completed. Genetics of Afghan and Skunk were used for this premium cheese strain. First of all, we can say one thing: Mission accomplished! We don’t say stuff like this if it’s not the whole truth. The growing traits of White Cheese Fast Flowering turned out how they should be. We are talking about mainly indica-dominant growing traits, indoor heights of 60-90cm, with yields of up to 500-550g/m². Outdoor growers usually get plants that turn out to be significantly bigger, with heights of 120-200cm. This also gets reflected in large outdoor harvests of 500-600g/m². Just to mention the best thing last: Only 50 days of flowering! When it comes to flavours, taste, and overall aromatic performance, White Cheese Fast Flowering sets new industry standards. Flavourful cheese buds that are seasoned or spiced, with the classic aromas of Skunk, are the purest delight and should be existent in every stash box around the world. What sounds a little bit exaggerated is actually not. 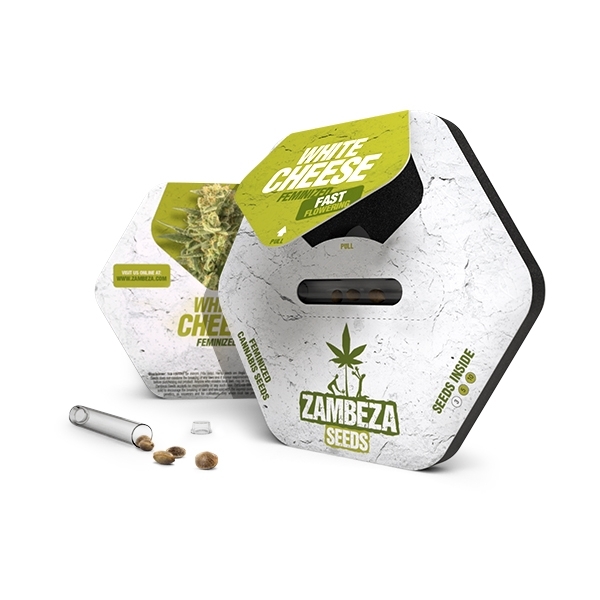 The fresh but spicy taste of cheese, together with 17% of THC, and happy feelings paired with relaxation, are really things to go crazy about. This cannabis strain is highly recommendable for both indoor and outdoor growers. It might be worth mentioning that Cheese genetics often tend to produce rock-hard nuggets. That’s awesome but involves the risk of mold when humidity levels are not within an acceptable range. However, when growers seek the aromas of spicy cheese, they can fully rely on the capacities of White Cheese Fast Flowering. It’s not only the growing speed what makes this strain remarkable, it really is a beautiful piece of nature, with blossoms that turn white and will get people high, just by looking at them. 3,2,1 Cheeeeeese! Comment : Guter Ertrag gute Qualität!! Comment : Je recommande , très bonne variété tant en gout qu'en défonce =) . Délai de floraison respecté mais si vous voulez un peu plus de stone laissez une semaine de plus ! Title : Sehr gute Ergebnisse! Comment : Der White Cheese Indoor-Grow verging wie im Flug. Von der Keimung bis zur Ernte verlief alles problemlos. Insgesamt eine gute und ertragreiche Pflanze. Die Ernte kann sich sehen, riechen und vor allem, rauchen lassen! Keine großen Schwankungen in den Phänotypen, gutes und zuverlässiges Saatgut. Samen gehen "sofort" auf und wollen endlich Wurzeln schlagen. Die Blütezeitangabe kommt gut hin, bei mir ~5 Tage +, aber einfach nur weil ich es völlig vergessen hatte. Sind bei mir leider tatsächlich in etwa so groß geworden, wie von Zambeza angegeben, weil ich bei diesem Grow zu faul zum toppen war. Aktuell habe ich auch getoppte White Cheese und dauch die entwickeln sich langsam zu kräftigen Bäumen. Die fertigen Buds haben ein sehr markantes und intensives Aroma, ein ziemlich schwerer süßlicher Geruch, finde dafür gerade die Worte nicht. Beim rauchen schmecken die Buds nach dem Curing sehr mild und erzeugen ein schönes "Gute-Laune-High". Nicht schlapp machend, aber dennoch etwas drückend. Strain ist zu empfehlen und wird seine Liebhaber finden. Candy Caramelo würde ich persönlich jedoch vorziehen. Comment : Questa varietà è un'ottima scelta per chi speri di trovare qualcosa di leggermente diverso. L'aroma è unico mentre il suo gusto di formaggio è degno di nota: sarà un'esperienza memorabile. La pianta può arrivare a produrre circa 50 grammi di cime forti e di qualità, per un effetto pesantemente mentale. La White Cheese è una scelta sicura per chiunque si stia augurando di aggiungere una varietà speciale alla propria produzione. Anche i fumatori più navigati ammetteranno che aroma e sapore di questa varietà hanno una marcia in più.